Synopsis: After a stint in a mental institution, Pat Solatano moves back in with his parents and tries to reconcile with his ex-wife. Things get more challenging when Pat meets Tiffany Maxwell, a mysterious girl with problems of her own. 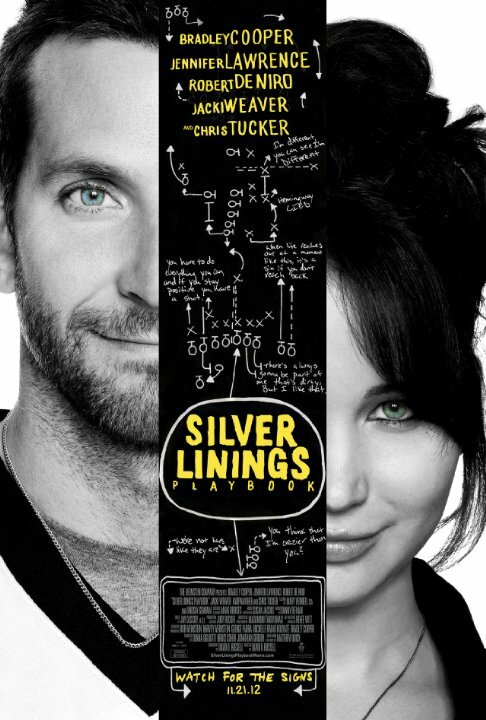 As their relationship plays out, an unexpected bond forms between them, and silver linings appear in both of their lives. Did You Know? This was the first film to receive a nomination for all four acting categories since Reds (1981). It was also the first “Big Five” nominee since Million Dollar Baby (2004) (Best Picture, Best Actor, Best Actress, Best Director, and Best Screenplay). The very next year American Hustle achieved both of these rare feats, Bradley Cooper, Jennifer Lawrence, and David O. Russell each being nominated for both films. Quotables: DR. PATEL: One incident can change a lifetime. I watched this film the first time when it came out in 2012, and I absolutely loved it. Watching it again now, it makes me very glad that it wasn’t made 80 years ago. Even just 20 years ago, the film would have ended despondently; our hero and our heroine would have succumbed to their mental illness, but not before the film vilified them and made injurious “truths” about mental illness. But this film addresses the struggle of living with mental illness on a daily basis. I know very little about the science of mental illness; all of my understanding of it comes from personal experience. I suffer from depression and anxiety, and most days for me are just going through the motions, trying to find things to do take my mind off of it. I sail through some days like a breeze, elated and energetic without really knowing why. But a lot of days are a challenge; I feel inadequate, unsuccessful, useless, worthless, irritable, melancholic, pretty much any disparaging emotion – you name, I’ve felt it. And much like my highs, I don’t know why I feel my lows. And when I say I don’t know why, I mean I have no reason; I can’t think of any specific incident that caused those emotions on any given day. I can think of specific incidents where my reactions were dependent on the emotions that I was already exhibiting. But I digress, this film – to me – is a big step in the right direction to understanding and coping with mental illness. Jennifer Lawrence is one of my favourite actors; she really embodies the characters that she plays, and Tiffany Maxwell is no different. There were a lot of really talented actresses who auditioned for this role, but I don’t think any of them could have played it as well as Jennifer Lawrence. When I watched the film the first time, I thought Bradley Cooper did a really good job, but didn’t really stand out at all. After watching again I noticed a lot of mannerisms and quirks with his character that I didn’t before, and I recognised a lot of things in myself in the character. He really deserves a lot more praise than I initially gave him. This is just an all-around excellent film and I’m certain that it will forever remain one of my favourites.